Today is Dr. Martin Luther King, Jr. Day, the day when our country honors the legacy of the great Civil Rights leader through a national Day of Service. But it is also a time to reflect on how we can follow the example of Dr. King by volunteering and serving others in our communities throughout the year. If you are interested in combining volunteering with bicycling, The Friends of Major Taylor Trail (FOMTT) is one such not-for-profit organization that you can work with during 2013. The FOMTT is a group dedicated to honoring the legacy of Marshall "Major" Taylor (Nov. 26 1878 - June 21, 1932), an African-American bike racer. It does so through the "use and development" of the Major Taylor Trail. The Major Taylor Trail extends over 6 miles between Chicago's Dan Ryan Woods forest preserve and Whistler Woods forest preserve in the Village of Riverdale. 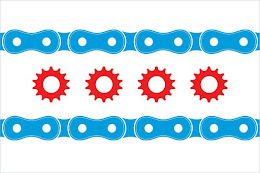 Bicyclists who travel the length of the path ride through parts of Chicago's Brainerd, Gresham, Beverly, Morgan Park, Roseland, and West Pullman neighborhoods. The trial is primarily an off-street path, and is easily accessed from the north via Damen Avenue. Maps are available here. Major Taylor's autobiography, "The Fastest Bicycle Rider in the World, is a compendium of many of his victories. It is also a dismal chronicle of races lost because of dirty tricks white riders used against Taylor. They would crowd him off the track, hem him in "pockets," rough him up off the field, curse and threaten him. "In most of my races I not only struggled for victory but also for my very life and limb." Major Taylor competed as a way of encouraging others facing the same types of unimaginable racism and prejudices that he did to overcome the challenges they encountered in their own lives. After his forced retirement, Major Taylor settled in Chicago's Bronzeville neighborhood before tragically dying at 52 in Cook County Hospital. His legacy lives on in Chicago through the work of groups like the FOMTT. The past few weeks have been ones of cynicism towards the sport of cycling. The news has been full with press coverage of the downfall of one of the sport's former icons. But bicycling is more than a sport. Bicycling can still bring communities together by uniting people behind worthy causes. There are still role models, like Major Taylor, who bike: those whose names are often forgotten because there goals were not centered around seeking fame and fortune. They are heroes not because they ever toed the start line of at a race but because of the good work they did and the challenges they overcame.